"If you say something to somebody's face or behind their back or on the Net or on the phone, you have to own it. And that means you have to think about it before it comes out." Walter Dean Myers is an amazing author who is able to pull students into stories, and push them to think about issues that are not always easy or comfortable. His bestselling books are for 7th graders and older: Monster , Lockdown and Fallen Angels . But in his latest book, The Cruisers , Mr. Myers tackles serious issues of race, free speech and integrity - but for a tween audience of 5th through 8th graders. Zander Scott and his friends LaShonda, Kambui, and Bobbi are eighth graders at Da Vinci Academy for the Gifted and Talented in Harlem and they're skating on thin ice. They publish an alternative school newspaper, The Cruiser. LaShonda wrote an article for The Cruiser called "Life on the High C's or, Do We Really Need A's and B's?" That was sure to get the attention of the assistant principal, Mr. Culpepper - and not the right type of attention. Now their history teacher has started a school-wide project on the Civil War dividing the 8th grade into Union and Confederate sympathizers, and Mr. Culpepper has asked Zander and his friends to play the role of mediators. Tempers flare as the Civil War role playing quickly turns ugly. A group of white students who call themselves the Sons of the Confederacy publish an editorial in the official school newspaper calling for the Southern states to break away from the Union. Their focus, however, is on "civilizing" "our brothers of African descent", and not on states' rights. Zander, his friends, and other African Americans at Da Vinci are angry. Zander struggles with how to avoid escalating the conflict into a full-fledged fight, while still getting his message across. I found The Cruisers very compelling on one hand, and slightly disappointing in other ways. I was especially moved by the resolution Zander and his classmates develop. Walter Dean Myers authentically captures the voice of young adults struggling with big issues in their own way. Zander focuses on owning your words, thinking about what you say before you say it, and standing by your beliefs. Integrity, in all its best forms. On the other hand, I found it hard to fully develop a picture of each character in my mind. At 126 pages, this is a brief, fast-paced novel. There are too many characters to give them fully developed attention. I think some students will find it hard to connect to this story because it's too heavy on ideas, and not enough on character. Another excellent book that makes me think about a character struggling with integrity is The Rock and the River , by Kekla Magoon. See my review here. The review copy came from my local library. If you make a purchase using the Amazon links on this site, a small portion will go to Great Kid Books (at no cost to you). Thank you for your support! Review ©2011 Mary Ann Scheuer, Great Kid Books. "Eeww, gross!" is the first reaction one student had. Immediately, others were peering over her shoulder, wanting to see what made her say that. Author David Schwartz knows how to hook students into exploring science and nature. In his award winning book Where in the Wild? , he used visual puzzles to hook children into learning more about the way animals use camoflauge to protect themselves. In What in the Wild? , he draws them in with mysteries and a few squeamish photographs to ask them to think about what animals make different structures. It's a winning formula! For example, one poem reads: "We're long and lithe, we wiggle and writhe. Of dead things we dispose./We daily toil to plow the soil, and help stuff decompose!" As you open the flap, you see a full color photograph of an earthworm depositing another cast on the pile. Schwartz combines nonfiction science writing, poetry and photography to great effect. This is a book kids will come back to many times. Also see the review on Wendie's Wanderings. If you like this, I highly recommend checking out Where in the Wild? and Where Else in the Wild? , also by Schwartz, Schy and Kuhn. The review copy was kindly sent by the publisher, Tricycle Press (we'll miss you!). If you make a purchase using the Amazon links on this page, a small portion will go to Great Kid Books (at no cost to you!). Thank you for your support. When we were little, my brother had a special pair of shoes with "go faster stripes" - he was absolutely sure that he could run faster with his black and yellow striped shoes. Because, as you know, nothing beats running and racing, zooming from here to there. If you have a little kid who loves racing, have fun with Monkey Truck , by Michael Slack. "Who's the little fella that the jungle calls king? A four-wheeled Banana-eating monkey machine." Monkey Truck is on a mission. There are chameleons to rescue, snakes to untangle and hippos to pull free. It will take a monkey truck that can race from here to there, dive under an elephant's stomping foot, and pull with super-monkey strength to help all his jungle friends. 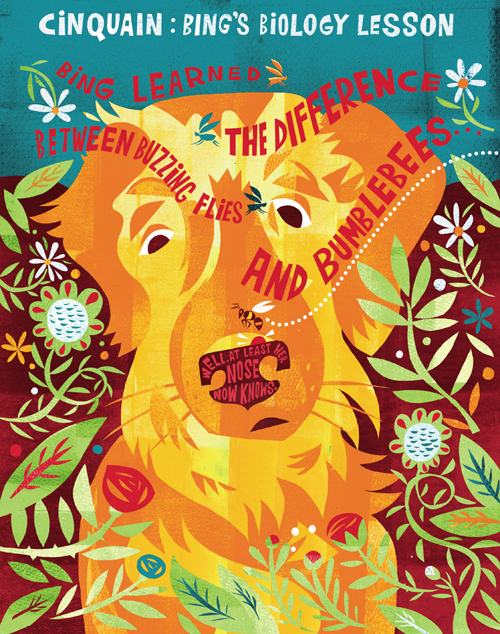 This playful picture book is full of playful energy, zany bright illustrations, and super-hero daring deeds that will appeal to preschoolers and kindergartners. I can just see making a Monkey Truck puppet and having it race around the toy room, rescuing stuffed animals stuck in precarious situation and making all sorts of crazy sound effects. The illustrations, the energy and the joy in this book bring alive reading for those kids who can barely sit still for reading time, but who have vivid imaginations. It's a great way to hook them into the fact that books can be a ton of fun! 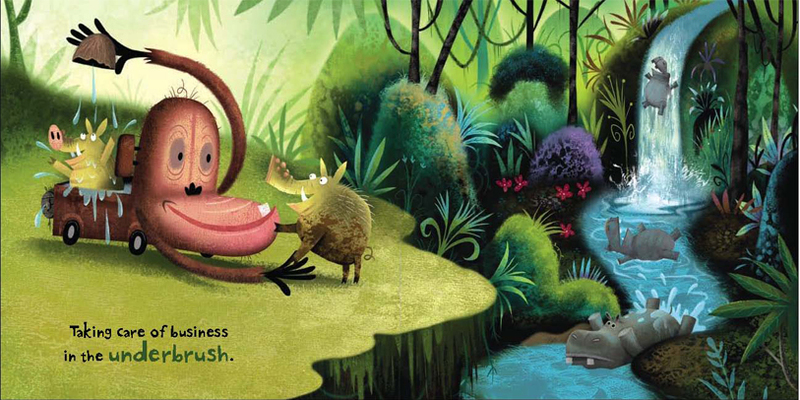 Michael Slack is an artist, illustrator and Monkey Truck is his debut novel as the author and illustrator. He illustrated the zany, hilarious My Life as a Chicken , by Ellen Kelley. He also has created a great e-book app for the iPad called Scruffy Kitty, perfect for ages 4 - 7. I'm definitely looking forward to more creative zaniness from him. For other reviews, check out BoingBoing and Jen Robinson's Book Page. The review copy was kindly sent by the author. If you make a purchase using the Amazon links on this page, a small portion will go to Great Kid Books (at no cost to you). Thank you for your support! 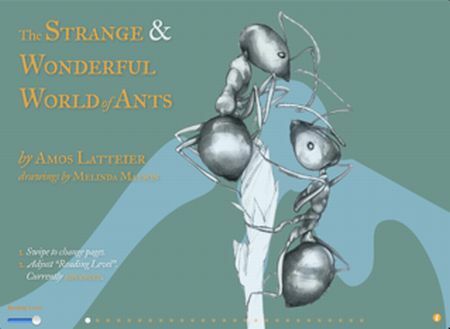 If you have a child who's fascinated by insects and nature, check out the eBook app The Strange and Wonderful World of Ants, available for iPads through the iTunes app store. It will intrigue kids who are naturally curious about insects, and particularly notable for the way it allows users to adjust the reading level to the detail and vocabulary level that best suits them. Beginning with a basic introduction to different types of ants, this eBook provides an interesting introduction to a variety of different topics. It explores how ants milk aphids and farm fungi, how ants store food and communicate with each other. Using the different reading levels, readers can explore more detailed information about a topic by switching from the beginning level to an intermediate or advance level. 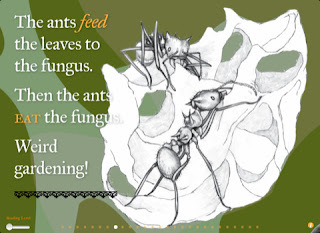 The advance level introduces concepts such as pheromones, symbiotic relationships, bivouac protective balls, and sharing food and communicating through trophallaxis. While the adjustable reading levels are a unique and fascinating feature, this app lacks a narrator read-aloud option. It would benefit from more built-in features such as narration, and clickable word definitions. The illustrations are visually appealing, but do not add enough concrete knowledge about the subject. They would benefit from a more scientific perspective, with labels and clear indication of which species are being shown. 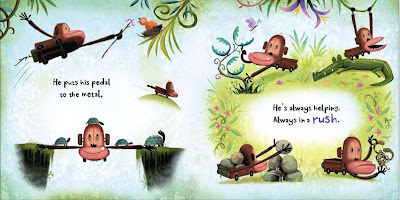 These are aspects of good illustrations you would expect from a solid non-fiction book for children, and eBooks should provide the same level of clarity with their illustrations. I am very excited to think about the learning potential of providing different reading levels for the same text. This is an inventive, unique app that will appeal to children with an interest in insects. However, I do think it would benefit from some features you would find in more traditional nonfiction books for children, and from some of the feature of more interactive eBooks. I downloaded this app on a free trial day, as promoted by Moms with Apps. The developer, Amos Latteier is a member of this collaborative group of family-friendly developers seeking to promote quality apps for kids and families. For other books about ants, you might be interested in National Geographic Readers: Ants , by Melissa Stewart, for beginning readers, or Killer Ants , by Nicholas Nirgiotis for intermediate readers. Advanced readers would be interested in Science Warriors: The Battle Against Invasive Species , a Scientist in the Field book by Sneed B. Collard III. For other reviews, check out I Education Apps Review; and Digital Storytime. Both provide in-depth reviews of The Strange and Wonderful World of Ants. For more nonfiction reviews, head over to Nonfiction Monday - hosted today by Three Turtles and Their Pet Librarian. If you make a purchase using the Amazon links on this site, a small portion will go to Great Kid Books (at no cost to you). Thank you for your support! One of the things I love is when reading provides a window into another part of the world. 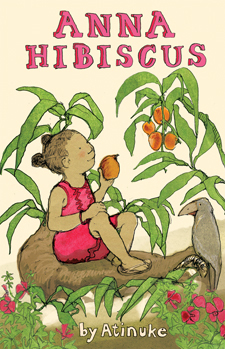 Anna Hibiscus, a new series of short chapter books, provides a wonderful view into the world of a young girl living in a modern, middle-class African city. The author, Atinuke, creates a likeable character, a little girl children will relate to, seeing much of themselves in her stories. But children will also appreciate how Anna Hibiscus's family keeps their traditional African ways. Anna Hibiscus is a perfect early chapter book, combining humor, nuance and a wonderful sense of cross-cultural connections. As a school librarian and a parent, I know how hard it is to find books that engage children who are beyond "readers" and ready to move into chapter books. Anna Hibiscus lives with her large extended family in Africa, “Amazing Africa”. They are a middle class family who commute to jobs in the city, talk on cell phones, and send text messages across the Atlantic. But they are also a large family who still keep many of the traditional African ways, living all together in a large compound where the cousins run and play, aunties pound yam in the courtyard after getting home from work in the office, and everyone wears traditional African clothing. Anna’s family is clearly one full of love and support, but they also have their challenges. Life is busy when you live with all your cousins, aunts and uncles and grandparents. But this extended family provides wonderful support and entertainment for Anna and her immediate family. Atinuke, a Nigerian born storyteller, has written a series that addresses issues such as cultural identity and economic issues with grace and a light hand, being both serious and humorous at the same time. Tobia's pen-and-ink sketches help young readers visualize Anna’s family, and the African customs and clothing. The stories will make young readers laugh, feel connections and understand life in modern Africa. Anna Hibiscus is followed by three other installments. Each features four short stand-alone chapters, good for readers beginning to read chapter books. This is really a series worth seeking out. If you're a librarian, there is a library binding available directly from the publishers: Kane/Miller. If you're a parent, ask your local bookstore and library to stock this book. It's perfect for kids who enjoy Ivy & Bean, and Ruby Lu, Brave & True. The review copy was kindly sent by Kane / Miller. If you make a purchase using the Amazon links on this site, a small portion will go to Great Kid Books (at no cost to you). Thank you for your support! Welcome to Poetry Friday! It's with pleasure that I share a treasure trove of goodies from around the internet. If you're here to leave a tidbit to share, please add a comment and I'll update throughout the day. Huge thanks goes to all Kidlitosphere members who served on the Cybils panels or helped promote the Cybils Awards in any way. These awards bring recognition to such a variety of books for children. The Cybils winner for poetry was Mirror Mirror: A Book of Reversible Verse, by Marilyn Singer.It's a standout choice, full of inventiveness, humor and creativity. Hooray! I must say that it's been a treat to hear from so many friends I met at the Kidlit Convention last fall. If you have a chance to go this fall in Seattle, it was a wonderful experience to meet and share our passion for children's literature and especially poetry. So this post is dedicated to my Poetry Friday pals. My tasty treat to share is A Dazzling Display of Dogs , concrete poems by Betsy Franco and illustrations by Michael Wertz. If you're a dog loving family, or if you want to share colorful, creative poetry with your children, make sure you read my review below at the bottom of this post! It's lovely to wake up with poems and messages from all my Poetry Friday friends. What a perfect way to start the day! Tabatha Yeatts has a lovely offering of PoemArt. Absolutely beautiful! At the Poem Farm, Amy is sharing a series of poems about reading to a cat. My daughters would adore these poems! Toby Speed write about the full snow moon at The Writer's Armchair. We had a beautiful moon here last night, with the clouds racing across the sky. Thank you, Toby, for sharing! At A Year of Reading, Mary Lee is Thinking Outside the Box. What a perfect thing to do, and to encourage our children to do! Carol Rasco at Rasco from RIF is sharing one of my favorite poetry books: The Blacker the Berry, by Joyce Carol Thomas and Floyd Cooper. At Carol's Corner, you'll find a new collection: Emma's Dilemma - Big Sister Poems, by Kristine O'Connell George. Perfect! I'll need to share this with my girls! This week on The Stenhouse Blog we have "Astronomy Lesson" by Alan Shapiro. Thank you! The weather has warmed up, so Irene Latham is thinking beach season. I'm in with an original "beach scene" poem that was inspired by a painting and appears in her new book, The Color of Lost Rooms . Congratulations on your new book, Irene! Diane Mayr is checking in with lots of offerings! At Random Noodling, she has an original poem, "Oh, To Be a Squirrel." Kurious Kitty has "Alms" by Anne Morrow Lindbergh, and, at Kurious K's Kwotes the P.F. quote is by Lindbergh. And, at The Write Sisters she also has a short weather poem by Anonymous. David Elzey is back this week with more original "'nother goose" rhymes over at fomagrams. Perfect to add a twist to your morning, and a laugh to your day! Laura Salas in with a poem called "Let Me Die A Young Man's Death" from J. Patrick Lewis' grown-up poetry collection. And check out this week's 15 Words or Less poems (come write one!). Today, Jama Rattigan is sharing Barbara Crooker's "Ode to Olive Oil" and dreaming about summer.I'll be right over! Dori Bennett is sharing Shipwreck by Luis Vaz de Camos. Reposted from My Daily Poem. It's raining in Haiti, and Ruth has a poem called "Before the Rain". Lunch break - more poems to feed your soul! Over at Chicken Spaghetti, Susan is in with a post from the archives, which links John Updike's short poem "Saying Goodbye to Very Young Children." Heidi Mordhorst is in today with a reflection on getting more poems published--bookable. Hooray! Karen Edmisten is feeling in sync with our dog-loving theme, but and is in this week with a little haiku her daughter wrote about their dog. :) It's here. Check It Out is sharing a Phillis Wheatley poem as a follow up to a review of the book Phillis Sings Out Freedom . See the poem "On Imagination" by Phillis Wheatley here, and the review here. "The Days Are Growing Green Again!" at The FATHER GOOSE Blog. Hooray! Signs of spring are definitely in the air. Thank you to Charles Ghigna, a.k.a. Father Goose. Sara's Poetry Friday contribution today at Read Write Believe is The Civil Wars's "Poison and Wine" and a small rumination on love and being known. At Wild Rose Reader, Elaine Magliaro has an original fairy tale poem titled "Apartment for Rent"--which is written in the form of a classified ad. Lots of fun! And over at Blue Rose Girls, Elaine is sharing a post titled "Let It Snow...Let It Snow...Let It Snow: Repetition in Poetry." Today Blythe Woolston offers a visual poem "It's the way they do ordinary things" by François-Marie Banier. Blythe, I love the idea of a visual poem. I was about to highlight Shadow, by Suzy Lee as a wordless poem because I think her wordless book is poetic in the way it plays with images and ideas. Banier's visual poem is amazing - thank you for sharing! Janet Squires is sharing The Cuckoo's Haiku, by Michael Rosen. It looks like beautiful verse paired with amazing watercolors! Carlie has an original poem about the winter woodpile today on her blog Twinkling Along. Priya has posted Mary Oliver's "Breakage" on her blog Book Crumbs. Melissa Wiley, at Here in the Bonny Glen, snapped a photo on her morning walk the other day that sort of begged a pairing with a favorite Emily Dickinson poem: "The Brain is Wider than the Sky". Wonderful pairing, indeed. I can feel the wind blowing and the clouds racing along. Today Jill Corcoran shares some of Ralph Fletcher's early love poems, from Buried Alive, the Elements of Love. As Jill writes, Ralph Fletcher gives "young adults reassurance that their feelings are important, universal, and necessary." Definitely worth checking out! Do you want to bring your poetry along with you? Check out Poetry of the Day app for the Android Market. Phoebe is sharing her first Poetry Friday - head over to Fly, envious time, till thou run out thy race, to welcome her to our event! She has a poem by her husband, Sean, in honor of Faustine's Day. MotherReader has three wonderful poetry books to share for African American History Month: My People, by Langston Hughes, with photographs by Charles R. Smith, Jr.; Stitchin' and Pullin': A Gees Bend Quilt, by Patricia McKissack; and Speak to Me (and I Will Listen Between the Lines), by Karen English. More after dinner! Keep sharing these lovely poems and books! Remember to leave a link to your specific post if you'd like me to share. 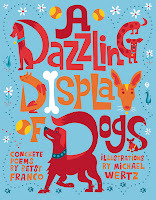 Today I'd like to share A Dazzling Display of Dogs - a wonderfully fun collection of concrete poems by Betsy Franco, illustrated by Michael Wertz. So grab a cup of coffee and stay for a bit. Betsy Franco and Michael Wertz team up again to celebrate the love we have for our pets: this time, they shed light on our lovable dogs. 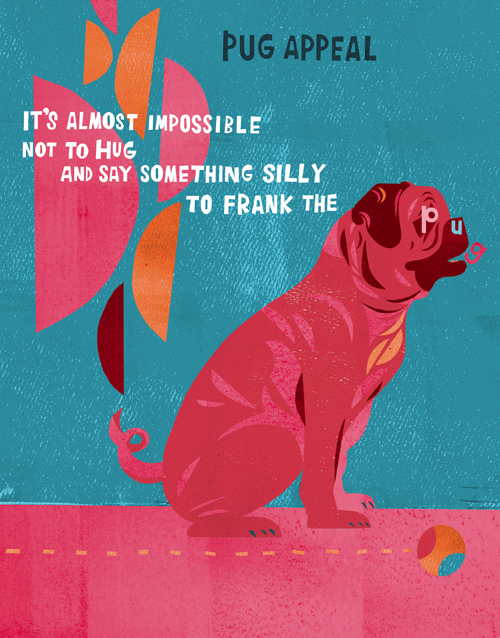 As in A Curious Collection of Cats , Franco and Wertz create playful, fun concrete poetry that is bursting with color. These poems arrange words within the illustrations, where the words gain meaning from where they are placed within the picture, and the words form part of the picture themselves. The color leaps off the pages, and kids will love following the words, figuring out the jokes and inside meaning. 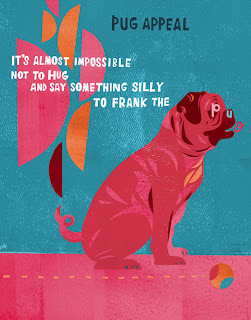 Franco and Wertz share their love of dogs, whether it's a tiny Pekinese peaking out from a backpack as it travels everywhere with its owner, or it's a Bassett Hound that goes "in and out / in and out ... again and again / and again and again." In "Emmett's Ode to His Tennis Ball," the text is enclosed in a circle held firmly in the dog's mouth. It begins, "Slobbery, sloppy, slimy, sphere-oh, tennis ball, I hold you dear..."
This will delight kids (and teachers), inspiring them to combine words and images in a fun, new way. I plan on sharing them using our document camera, so the kids can see the poems projected on the screen. The visuals are exciting and draw them right into the poetry, as they figure out how to read each poem. Michael Wertz is a local print maker and illustrator, here in Oakland, CA. His dynamic illustrations are full of action and color, but they are carefully created balancing colors, typeface and details that make reading the poems a joy to figure out; the overall effect is never confusing or crowded, but rather punchy and humorous. Head over to his website Wertzateria and his blog to find out more. Betsy Franco is an accomplished poet, author and actress. Her work ranges from fun school poems like Messing Around on the Monkey Bars , to poems about the natural world around us as in Birdsongs and Pond Circle , to books that capture the voice of teens and young adults, as in Metamorphosis and Things I Have to Tell You . 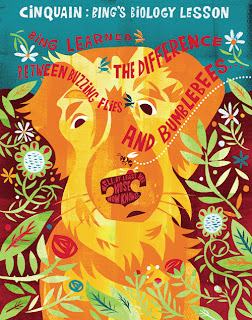 A Dazzling Display of Dogs has been given a starred review in the School Library Journal. Also see reviews by Jen Robinson and Becky's Young Readers. The review copy came from our local bookstore, Mrs. Dalloway's on College Ave in Berkeley, and will be part of our personal library. A Curious Collection of Cats was given the 2010 Lee Bennett Hopkins Poetry Award honor award - here's hoping the dogs get noticed too! Review ©2011 Mary Ann Scheuer, Great Kid Books. All images ©2011 Michael Wertz; shared with permission by the illustrator.